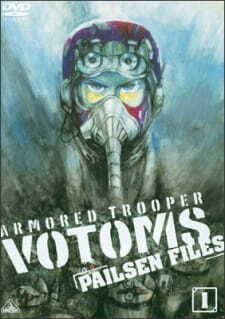 After 1994's Shining Heresy more or less failed, the Votoms franchise went quiet for over a decade. It's return further explores the familiar grounds of Chirico Cuvie's past, and serves as somewhat of a sequel to Red shoulder document: Roots of ambition. If this sound a little inaccessible that's because it absolutely is made for fans familiar with both the original Armored Trooper Votoms and it's follow-up OVA's. To make matters worse, the mechs are now done with CGI, and mid-2000's CGI at that. Pailsen Files really is just for those interested in the franchise, but past that it's quite a good show that scratches an itch no other votoms show does. Coming off the conclusion of Roots of ambition, the titular Yoran Pailsen is in deep trouble as the full force of a military tribunal comes down on him. Intelligence undersecretary Fedok Wokkam is determined to further his own agenda with whatever knowledge Pailsen holds, and the interactions between them form the smaller half of a split narrative that lasts through the series. On the other side, Chirico Cuvie and his new handpicked teammates are used as pawns in Wokkam's game, and repeatedly forced into dangerous situations the same way Pailsen once tested his Red Shoulders. Chirico's team ultimately gets the most screentime, even if their actions have limited impact on the larger picture. As is usual for Votoms they all have pronounced characteristics, ranging from a phlegmatic squad leader to a coward engineer. Much like Chirico's Kummen squad they continually have small squabbles and other things going on, while at the same time ploughing through hordes of enemy AT's. It's hard to call most of them great characters, but they're all grounded soldiers with positive and negative traits, and they provide the noise to counteract Chirico's quiet demeanor as other supporting characters have done before. What makes the show work is that unlike most of the other OVA's following the original Votoms, Pailsen files has a proper 12-episode run, twice as long as any other sequel or prequel. This allows time to firmly establish it's cast and give them some development, have a plot that steadily progresses without feeling rushed or cut short, and allows for several long setpiece battles that end up being more diverse and interesting than anything seen before in Votoms. This is also the only entry in the entire franchise where Chirico's past in the Gilgamesh military is truly explored, something I had personally found to be extremely lacking in earlier OVA's. It's impossible to talk about the Pailsen Files without getting into this. While most of the presentation like sound and direction are extremely similar to Armored Trooper Votoms, the CGI AT's are not. And it's hard to make a real verdict on the quality on display when it has to be compared to a TV anime from the 80's. Votoms hasn't always had amazing animation, but the show did quite well by making sure it's action was usually quick-paced and involved a lot of explosions. The later OVA's did a decent job of improving the quality while maintaining the spirit, but there was little chance a franchise like votoms could avoid joining in on the CGI-era. Pailsen Files tries it's best, but it's hard not to be a little disappointed that some of the best action setpieces aged as badly as they did. Especially some of the early bullet effects are simply sub-par even for the time, and while the quality slightly improves as the show goes on, it's not enough. The one big plus of using CGI is that the show is more or less free to display as many AT's as it wants at any point in time, and as such manages to have even more of them on screen than was possible before. Ultimately your enjoyment of Pailsen Files hinges entirely on how much the viewer cares about the details of Chirico's past and that of the Astragius galaxy and it's politics, as well as one's ability to look past the questionable CGI at the ideas behind it. Pailsen Files isn't the most necessary or the prettiest of the Votoms OVA's, but it's probably both the smartest one as well as the entry with the most creative battles, and that makes it more than worth checking out for fans of the original.